Slightly more tender and flavoured than the white but later. Sow from late February for a continuous supply. Pale green with crisp white flesh. Sow from late February for a continuous supply. 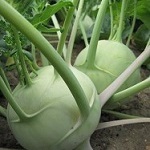 Extra large variety that can grow to 8kg! Slow to bolt. Sow March onwards.